Use Rooting Hormones, or Not? Foliar applied Rooting Hormones in the form of K-IBA rooting solutions are used to propagate leafy plants from cuttings either by single or multiple applications. Plant Propagation: Basics of single and multiple rooting hormone applications. Cuttings taken from stock plants are used to propagate new plants. Using needed rooting hormones, growers are sometimes confronted with slow-to-root and hard-to-root cuttings. Multiple Rooting Solution foliar applications may improve root formation. Solutions may be applied once or multiple times in ten day to two week internals, and customized programs. Multiple solution applications use the foliar Spray Drip Down® Method which does not disturb planted cuttings. The need to use Rooting Hormones when propagating plants from cuttings. The ‘Use Rooting Hormone or Eat Ice Cream?' article by BallFlora Plant's Advisors, squashes the myth by growers who feel ‘any' roots produced on cuttings are enough. The article says, to produce high quality plants, the cuttings need high quality roots. Cuttings given rooting hormone applications produce higher quality roots and better root mass compared with untreated controls. Trials used the Spray Drip Down® Method of application using Hortus IBA Water Soluble Salts® rooting solutions. Roots on cuttings are formed by the natural plant substances IAA (Indole acetic acid) and IBA (Indole butyric acid) in ways not fully understood by researchers. The substances, called ‘auxins', are used by the cuttings to induce root cell division and root formation. Auxins are also called ‘Rooting Hormones'. Plant produced IAA and IBA are likely inadequate on their own to induce root formation on cuttings. Externally applied IBA boosts the cutting's natural rooting ability. To enhance root production, rooting hormones are ‘foliar' applied to the leaves of plant cuttings, or to the basal ends (first application). 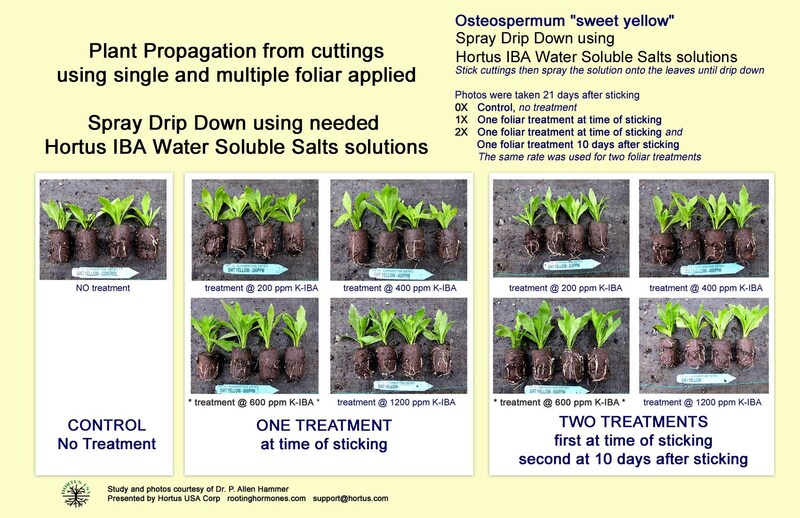 Rooting solutions are used at the time of sticking and/or multiple foliar times; multiple foliar applications must be done by the Spray Drip Down® Method. Only at the time of sticking, dry powder rooting hormones are sometimes applied to the basal ends of cuttings. The Spray Drip Down® Method uses rooting solutions with IBA in the water soluble [aqueous] form K-IBA, made with Hortus IBA Water Soluble Salts or Rhizopon AA Water Soluble Tablets. The cuttings are to be in the growing, non-dormant, state. 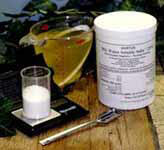 Aqueous K-IBA rooting solutions are required for foliar applications. IBA and K-IBA rates are considered to be the same. The rooting solution is sprayed onto leaves of plant cuttings until there is a ‘drip down' off the leaves. Entering the plant's vascular system through open stomata, IBA (K-IBA) translocates by polar transport to the basal end of the cuttings. At the basal end, the cuttings use IBA to induce root formation. •	Repeat foliar sprays in the next two to three days. •	Repeat foliar sprays in about ten day to two week intervals. Multiple rooting solution applications need to be tested on various plant varieties. If a particular plant species or variety is known to have low-rooting-ability, then beneficial multiple applications may be slow to be effective. The speed of root formation may be within a few days for physiologically 'juvenile' herbaceous plant cuttings, to many weeks for ‘mature' hardy plant cuttings. When K-IBA rooting solutions are applied to the cuttings several times over an extended period, root formation may be speeded up. •	For 'fast-to-root cuttings' an initial application may be adequate. •	For 'slow-to-root cuttings' it may be necessary to increase K-IBA rates. An application may be made the day of sticking, then several foliar applications in ten day to two week intervals. •	For 'hard-to-root cuttings', some ‘mature' cuttings may benefit from several foliar applications in the first days after sticking, then additional applications in ten day to two week intervals. These cuttings should be taken at the time of the growing season when rooting ability is known to have high root yield. •	first application within the day of sticking, then several applications in two week intervals. 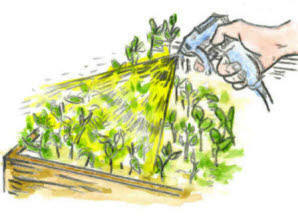 Other growers use coarser sprays where the sprayed rooting solution drips down the leaves by the Spray Drip Down Method. Based upon the size of the cuttings, the common rooting solution rate is about 300-400 square feet per gallon (75-100 sf./liter). In Dr. Davies' Ficus pumila study, optimum IBA solution rates were first established by block test in a wide range of rates. The study concluded, juvenile cuttings required lower IBA rates, and produced roots faster than mature cuttings. "Mature cuttings did not root as efficiently as juvenile material. IBA treated mature cuttings required higher exogenous [external] auxin levels and longer time to obtain maximum rooting than juvenile cuttings." Juvenile cuttings given multiple IBA applications had increased rooting in all secondary application dates. Mature cuttings required a longer time between first and secondary applications to achieve improved root formation. Also noted, application of IBA "above the optimum level reduced root length and quality indicating the primordia elongation [origin length] was decreased." (The decrease rooting effect was also noted in Dr. Hammer's Osteospermum trial block upper and lower rates.) The Fucus pumila study indicates there are positive benefits from multiple rooting solution applications. •	Comparisons: The best juvenile plant cuttings may be taken from stock plants started in the current growing year. Cuttings-from-cuttings are desirable. Perennial and woody plant cuttings may be taken either juvenile or mature depending when they are taken in the growing season. •	Rooting ability may be influenced by juvenility and/or genotypes, such as color variations. •	Applications: Juvenile cuttings may need secondary foliar applications fewer times, at shorter intervals, than mature cuttings. Some growers foliar apply on the day of sticking with additional applications in ten day intervals. •	Rates: Juvenile cuttings likely require lower rooting solution rates than mature cuttings. •	Season: Juvenile cuttings taken early in the season likely require lower rooting solution rates than mature cuttings taken later in the season. •	Applications: Mature cuttings may need secondary foliar applications several times, at longer intervals, than juvenile cuttings. Some growers foliar apply solutions in each of the first three days after sticking; additional applications are made in two week intervals. •	Rates: Mature cuttings likely require higher rooting solution rates than juvenile cuttings. •	Season: Cuttings taken from old stock plants may have rooting difficulty. Mature cuttings taken later in the season likely require higher rooting solution rates than juvenile cuttings taken early in the season. Hard-to-root cuttings are best taken at the time of year known to produce higher root yields. •	Hard-to-root mature cuttings may react slower to additional applications compared with easier to root cuttings. •	Mature cuttings may react best to K-IBA applications in days close to the time of sticking. Several applications in two week intervals may be beneficial. Cuttings used in Dr. Hammer's Osteospermum study were taken from plantations. These plantations maintain physiologically juvenile stocks where mother plants are established from cuttings-from-cuttings. Trials used the Spray Drip Down Method of application using Hortus IBA Water Soluble Salts rooting solutions. Using the optimal rate, the study showed, there may be no apparent downside to multiple applications. It was shown, before making production decisions, there is a need to trial a wide range of rates. It is first necessary to set the optimal rate by doing a block of trials on un-rooted cuttings including low and high rates. This study used four rates: 200, 400, 600 and 1200 ppm IBA (K-IBA) using Hortus IBA Water Soluble Salts rooting solutions. IBA and K-IBA rates are the same. •	Slowed root formation was observed at 200 ppm (low) and 1200 ppm (high) IBA (K-IBA) rates. •	At 600 ppm IBA there was optimum rooting for both single and two time foliar applications. •	Two time applications at 600 ppm IBA (K-IBA) had the best root mass. Applications were made at the time of sticking and again at ten days after sticking. Rooting hormone application, and cutting storage: The initial rooting product application (dry powder or rooting solution) does not necessarily have to be done the same day of sticking; it may be done the day after sticking. Cuttings may also be are treated then stored for later sticking. Level crops: To level crops, additional sequential applications may be made in about ten day to two week intervals. Many different production lots: Growers who root many crops and cultivars at once should separate the production lots according to rate needs. "IBA" marked flags have been used to show the ‘IBA (K-IBA) RATE' for each lot. Rooting solution and dry powder rooting hormone selection: K-IBA rooting solution rates for foliar Spray Drip Down and Total Immerse Methods are lower than used for the basal Quick Dip Method. Dry Powder rooting hormone powder concentrations are not directly correlated to rooting solution rates. Quick Dip and Dry powder rooting hormones are only used for first applications. To compare, if for specific plant cuttings a high percentage IBA dry powder rooting hormone is needed for rooting, then a high rooting solution rate is needed too. Inhibit bud formation: Rooting solution applications inhibit the growth of lateral buds so that the plant grows upward more than outwards. This reduces the need for otherwise applied growth regulators to produce that effect. Temperature needs: Foliar spray operations should NOT be done when cuttings are dormant due to high or low temperature. •	The rooting solution enters the plant's vascular system through open stomata. Stomata close in cold or hot temperatures; the solution can not enter the plant. The solution may be washed off when cuttings are foliar hydrated; further entry of the IBA will be stopped or diminished. •	Using the Spray Drip Down Method at cold temperatures below about 45 F there may result in delayed rooting and leaves which show irregularities. Generally it is best to applying both the rooting solutions and cuttings above 60 F.
•	In hot climates the cuttings are stuck during the day and maintained with mist. The foliar Spray Drip Down Method is done early the following day when temperatures are cool. Transplanting: To improve transplanting, rooted transplants may be treated using Spray Drip Down Method IBA rooting solution sprays once or in about two week intervals. Solution rates are similar to those used for initial rooting. Grass division transplants are typically treated by this technique. Decisions must be made to make one or multiple rooting solution applications. The cuttings: The best cuttings must be selected. Maturity level of the cuttings is critical for good root formation. Physiologically 'juvenile' cuttings require lower rooting hormone rates and produce roots faster compared with ‘mature' cuttings. The rates: Each plant variety requires trials to determine the optimum solution rates. Likely the same rate is used for first and multiple applications. Optimum rooting rates are established through a range of block trials from very high to very low. The protocols: Foliar application protocols to apply K-IBA rooting solutions are influenced by cutting characteristics. Variety and genetic variations may be a determining factor to determine the procedures. Annual plant cuttings likely need single applications to produce required roots, some require several applications. Perennial and woody plant cuttings likely need multiple applications. It is worthwhile to use multiple rooting solution applications when propagating plants from cuttings. Labor and material needs are relatively small to get superior roots! Dry Dip Method (only used for a first rooting hormone application). •	Hortus IBA Water Soluble Salts®- water soluble to make over 100,000 ppm K-IBA (aqueous) rooting solutions. Hortus IBA Water Soluble Salts and Rhizopon® AA Water Soluble Tablets, dissolved in water make aqueous IBA (K-IBA) rooting solutions; the only labeled rooting products for use by foliar methods. Hortus IBA Water Soluble Salts and all Rhizopon AA products have zero hour REI. •	For single applications: the Spray Drip Down Method® (or multiple applications), Total Immerse or Basal Quick Dip Methods may be used. •	For multiple applications after the first application: only the Spray Drip Down Method® is used. •	The basal ends of the cuttings are dipped about 3/4 inch into the rooting solution then stuck in media. Rates are established per plant variety. •	The cuttings are stuck in media. A skilled worker sprays the rooting solutions onto the leaves until the rooting solution drips down. Spraying is done soon after sticking or when not under heat stress, such as early morning. An excess of solution is best rather than a starved liquid volume. Facility appropriate spray equipment is used such as backpack, hydraulic, booms, or robots. Total Immerse Method (only used for a first rooting solution application). •	The cuttings are totally immersed a few seconds in the rooting solution then stuck in media.